Just because you don’t have the budget of the execs at Google doesn’t mean you can’t afford a quality, supportive office chair. While the Aeron chair by Herman Miller might be a bit beyond what you’re willing to spend, there are a whole host of lower priced models with a high comfort rating from consumers. Cheap doesn’t always mean ugly, low quality, or poorly built. The hard part? Sifting through the hundreds of available options and determining the good from the bad and the exceptional from the mediocre. That’s what this guide is for. We have taken the guesswork and study time out of office chair shopping by extensively researching and reviewing the best models. My top pick for this category? The Chrome Computer Task chair. Yes, it is a minimalist model, but it is undeniably comfortable, supportive and durable. If you’re looking in the lowest price point category, this chair is a SOLID choice. All of the options I am listing are light on your wallet, but are definitely still good quality chairs that you can find comfort and support in. They’re also so cheap that you won’t have to think twice about buying one. First on our list of the best cheap office chairs is the Boss Black Task Seating chair. It has a capacity of up to 150 lbs and it ships ready to assemble. The Boss is a very simple chair, with minimal frills, that is comfortable, easy to adjust, and easy to use. The assembly will only take you a couple of minutes at most. While this chair doesn’t have luxury or high-end materials used in its construction, it is good looking in its minimalist design and is both supportive and compact, making it a great choice for small spaces. For a daily chair that’s easy to use and that you can put almost anywhere, the Boss is a great offering and won’t break the bank. Considering the price of this chair, the quality of construction, comfort rating, and support, it is definitely a bargain. At this price, you can snag one for yourself, your kid, a friend, or even seat a whole army of interns at your office. It also has a very respectable rating of 4.3 out of 5 stars from over 80 purchasers. This is a seriously inexpensive, but high-value option that will be an asset to any home office or workplace. If you are looking for an affordable and padded leather chair, then you definitely need to take a look at the Ergonomic Leather Office Executive chair from the good chair experts at BestChair. This chair has soft and comfortable PU leather upholstery with just enough padding to provide long-lasting support. 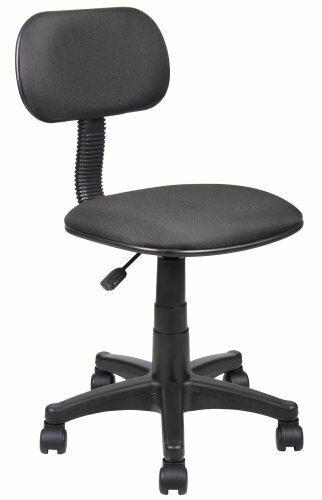 It also has a stellar lumbar supportive design, adjustable height, and it can swivel 360 degrees. 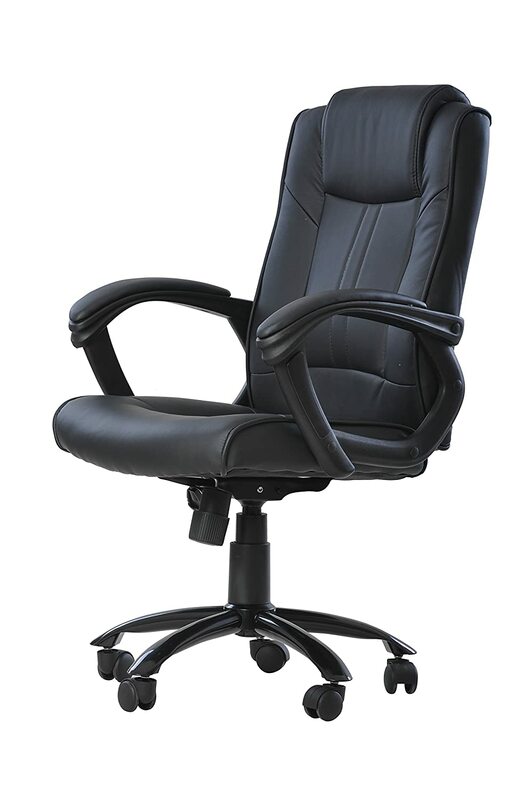 This chair is excellent if you are in the market for a high-back leather executive style chair. The materials also make it easy to clean and maintain, which is an important consideration if you will be using this chair as your primary work seating. The BestChair Ergonomic requires a bit of assembly, though most purchasers found it to be pretty quick and painless as far as chair assembly goes. The only word for this chair is “steal.” With the great price and solid performance of this option, it’s not a surprise that it’s on our list of the best cheap office chairs. Last on the list, and the cheapest of the three, is the Chrome Computer Task Chair with tractor seat. 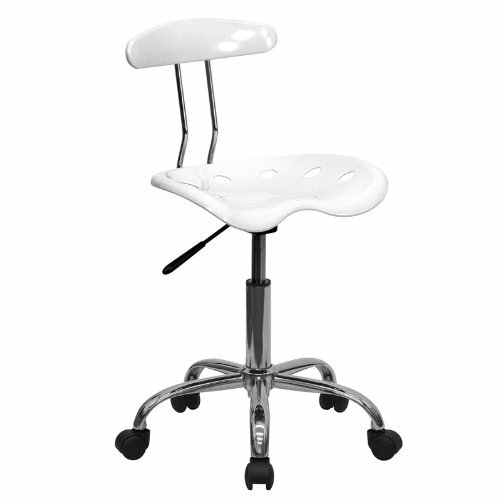 This chair has high-density polymer construction on the seat and the back, with adjustable height. There are lots of colors to choose from with this model – white, black, blue, pink, green, red, orange, silver, yellow, apple green, violet and deep blue. The wide color range is a great perk, especially if you are looking to purchase a large quantity of similar chairs in a specific color palette for an office, dorm, or a home with several work stations. With its contemporary looking design, this task chair will look great in any stylish work environment. This option is thoughtfully-designed with your lumbar comfort in mind; it is structured to actually prevent you from sitting too far back in your seat and positions you for optimal posture and vertical alignment. Assembling this chair is a breeze, purchasers found instructions easy to follow and assembly time to be quick. With 4 out of 5 stars from over 295 customers on Amazon, you can’t deny that it’s a crowd pleaser. And for its low price, you just can’t beat the bang you get for your buck with this little powerhouse. here. Your blog should go viral. You need initial traffic only.